Don’t get mixed up with the ancient Greek King Phineas, or the husband of Cleopatra, as you won’t find them here – this one is a little more, lets say, up to date. And if you are after these ones we apologise for what you are about to read as it will mean absolutely nothing to you! Our Phineas (and Ferb) is an animated children’s TV show which originated in America on the Disney Channel. It is very funny, and has clever comic timing, as well as running gags which mean adults also find the show hilarious. The story concerns two stepbrothers and their annual summer holiday. As stepbrother’s they have different surnames, Phineas is a Flynn whereas Ferb, from the UK, is a Fletcher and this is refreshing to see on a kids television programme. As typical brothers one of their key roles in life is to annoy their sister called Candace, although this is not always done intentionally as they would never wish her any harm. Although she often gets her own back by telling on them when she discovers just exactly what they have been up to – the trouble is by the time mum comes along all is well again so she never actually gets to bust their schemes. Overall their main aim every day is to have a lot of fun, and this they certainly achieve. In each episode there is an underlying plot between characters Agent P, who is Perry the Platypus or simply Perry, and an evil character, the crazy, bumbling scientist called Dr Doofenshmirtz who likes to say ‘Curse you Perry the Platypus’ as his plans to take over the world are foiled. Ferb is a boy of little words and speaks rarely. He has the brains of the two and has a real flair for ‘engineering’. He strangely has green hair and wears quite high waisted blue trousers. 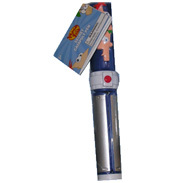 Like his brother Ferb he has very large eyes – look at the Eye Poppers, they are great fun. Or try the Grown your own Ferb – see what they have done there?! Hey where’s Perry? He’s here of course - Perry is a green colour, wears a hat – the sort secret agents wore in old films, and has the key attributes of a Platypus which is a sort of aquatic mammal which has a strange duck like orange beak for a mouth and a big tail like a beaver, oh and webbed feet too. Yes just how you imagine a crime busting professional, not. These main characters can be collected here as plush collectibles or plastic figures. Are you too old to be looking at this shelf? Yes, yes I am! Simply Ferb-ulous!